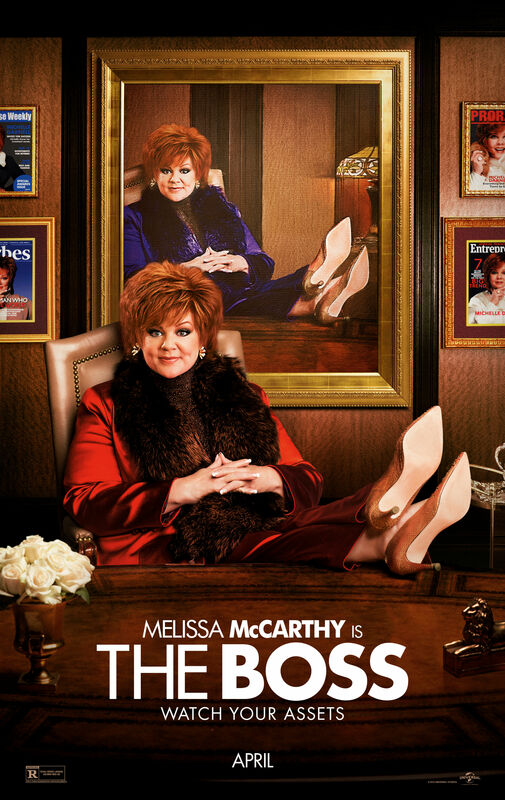 Academy Award®-nominated star Melissa McCarthy (Bridesmaids, The Heat, Tammy) headlines The Boss as a titan of industry who is sent to prison after she’s caught for insider trading. When she emerges ready to rebrand herself as America’s latest sweetheart, not everyone she screwed over is so quick to forgive and forget.McCarthy is joined in The Boss by an all-star cast led by Kristen Bell, Peter Dinklage and Kathy Bates. Directed by Ben Falcone (Tammy), the comedy is based on an original character created by McCarthy and written by McCarthy and Falcone alongside their Groundlings collaborator, Steve Mallory. The film is produced by McCarthy and Falcone through their On the Day productions and Will Ferrell, Adam McKay and Chris Henchy through their Gary Sanchez Productions. Cast: Melissa McCarthy, Kristen Bell, Peter Dinklage, Kristen Schaal, Kathy Bates. Rated R for Sexual content, language and brief drug use. The Boss is a comedy that’s sporadically funny and consistently uneven through out. It’s not nearly as bad as Tammy, also directed by McCarthy’s husband Ben Falcone, but it does feel like a missed opportunity. The supporting cast is made up of an excellent collection of comedic actors like Tyler Labine, Cecily Strong and Kristen Schaal but proceeds to give them nothing to do. Kathy Bates passes through and doesn’t really add much to the film which is a shame because it does seem like there’s a much funnier movie in there but it just never hit’s the sweet spot. Melissa McCarthy, to her credit, is committed as always and she delivers some of the films funniest lines. Peter Dinklage seems incredibly at home on the comedic side, I just wished his character was a bit more fleshed out. Overall it’s a forgettable comedy that’ll probably end up on a late Saturday afternoon double header with Identity Crisis. so.. wait until cable, huh? Probably a good choice bud!